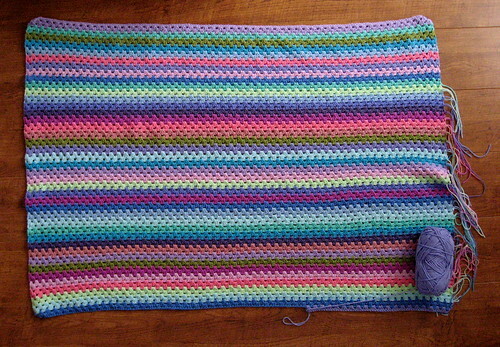 While there have been sneaky peeks, I haven't yet posted a proper progress picture of the Spring Cloud Blanket. So here it is in its current state. You can see from the top right corner that I've done a bit of weaving in ends, but it's always much more fun to add new stripes than to weave in ends. I'm trying to do some of it as I go though, so I'm not stuck with a massive job at the end! I'm still not sure that I like the bright pink (Fondant) so much, but I suspect the Wee Lass will be glad it's there despite our plans not to inundate her with pink. 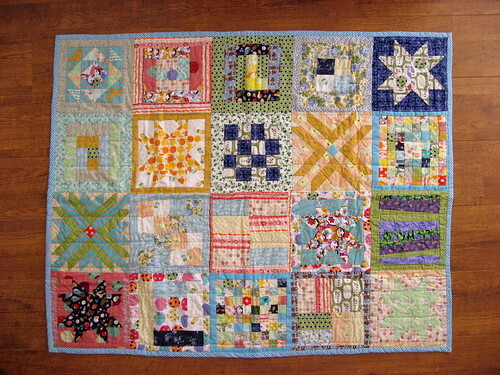 There's nothing like having crafty girlfriends for receiving the best baby presents ever... the girls back in Montreal made baby quilts for both Barbara's Wee Lad and my Wee Lass. The Wee Lass has already hung out on her quilt for a little wiggle time this morning. I'm looking forward to adding it as a cozy layer to her bed this winter, but in the meantime it makes a beautiful spot to play! 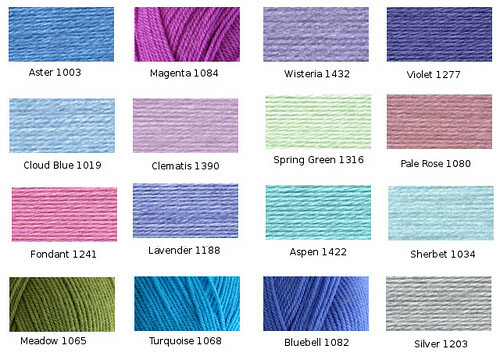 Ordering art and craft supplies online is convenient, but choosing colours can be very tricky. I thought I'd show you the difference between the online swatches and my own colour swatches for the spring cloud blanket. Obviously, part of the issue is that all monitors are slightly different, but I found the colours much more vibrant in real life. (I couldn't find nice swatches online for a few of the colours, so I used my photos in both palettes for those ones). 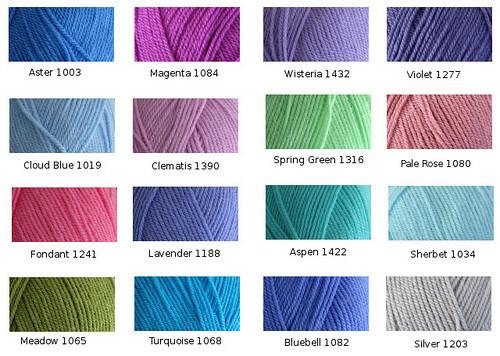 In fact, even my "accurate" photos still look paler than the yarn looks to my eye. And who knows what they'll look like on anyone else's monitor. But I thought it was interesting to compare and I know when I was picking out colours, it was nice to see various people's photos of the yarn to try to get a better idea. The blanket continues along stripe-ily. A long ways yet to go, but I've been averaging a stripe a day recently. Edited to add: The yarn is Stylecraft Special DK and the colours I have are: Aspen 1422, Aster 1003, Bluebell 1082, Clematis 1390, Cloud Blue 1019, Fondant 1241, Lavender 1188, Magenta 1084, Meadow 1065, Pale Rose 1080, Sherbet 1034, Silver 1203, Spring Green 1316, Turquoise 1068, Violet 1277, Wisteria 1432. 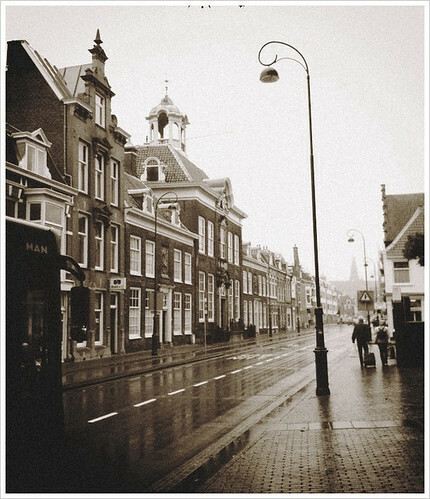 It was misting rain, of the sort that is so light you barely feel it, but you get quite sopping, but it was such a picturesque place. We went to see some friends rather than for sight-seeing, which is just as well given the weather. I can see us returning for an afternoon sometime (when it's sunny), as it's only about 20 minutes by train from Amsterdam. We're going to a little half-birthday celebration tomorrow for another wee lass, so I wanted to take along a small prezzie. 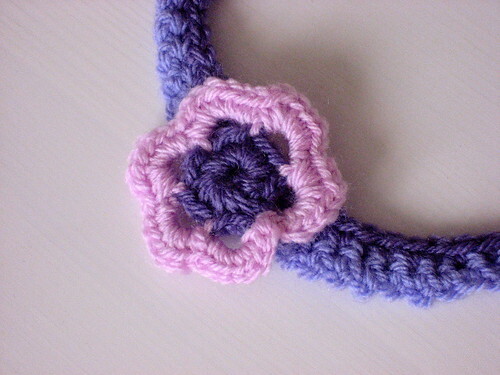 The idea for making a headband occurred to me and I found a simple pattern on Ravelry. 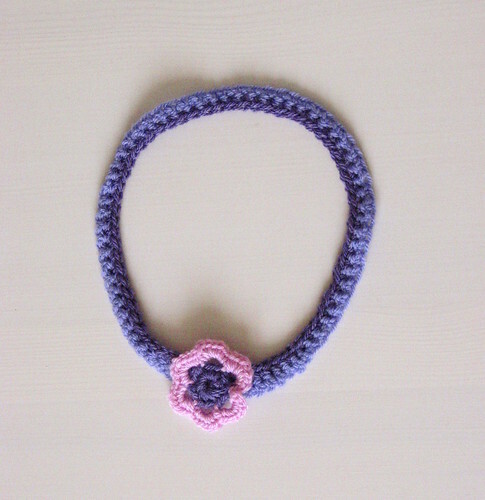 I love how fast crochet whips together; I spent at most an hour making this (and that includes ripping part of the flower out when I realised that I had made a silly mistake). I can see myself making the flower again for other purposes too. It does seem rather large around, but I stuck with the 6-9 month size because better too big than too small. For more details, see the project on ravelry.